It’s no secret: Cinco is the best Secret Santa. 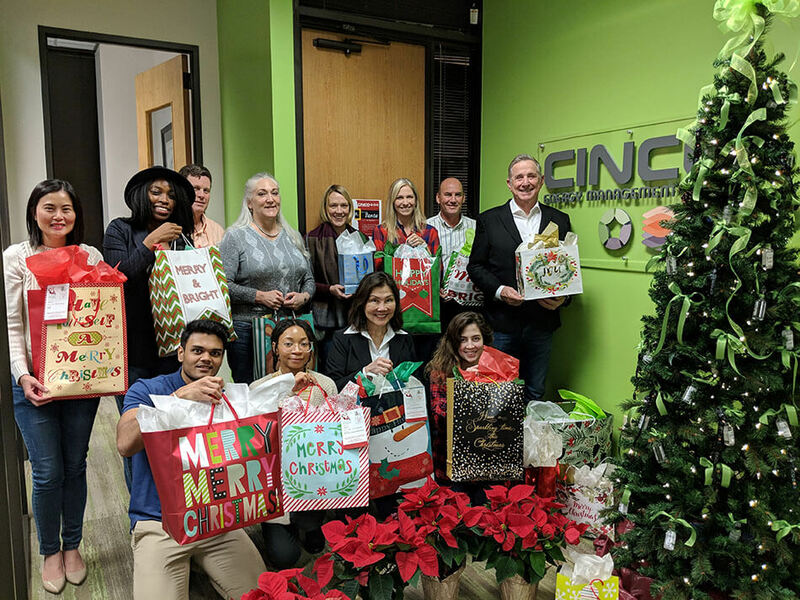 For our 2018 Holiday Charity event, the Cinco team gladly partnered with @FortBendSeniors and became a Secret Santa for local senior citizens. Santa’s sleigh was filled to the brim with requests for socks, blankets, slippers and other daily household items from our local seniors; a challenge that our santas happily accepted. Our sponsored seniors will receive their Secret Santa presents on or before Christmas along with their daily meals from Fort Bend Seniors. Cinco is happy to help fill some hearts full of joy this year and wish a very Merry Christmas to Fort Bend Seniors! For more information about how you can help our Fort Bend Seniors visit their donation page! Cinco Energy Welcomes Back Teachers with a 'Sweet' Ice Cream Treat! Cinco had the honor of kicking off the 2018-2019 school year with Bear Blvd. School this week. 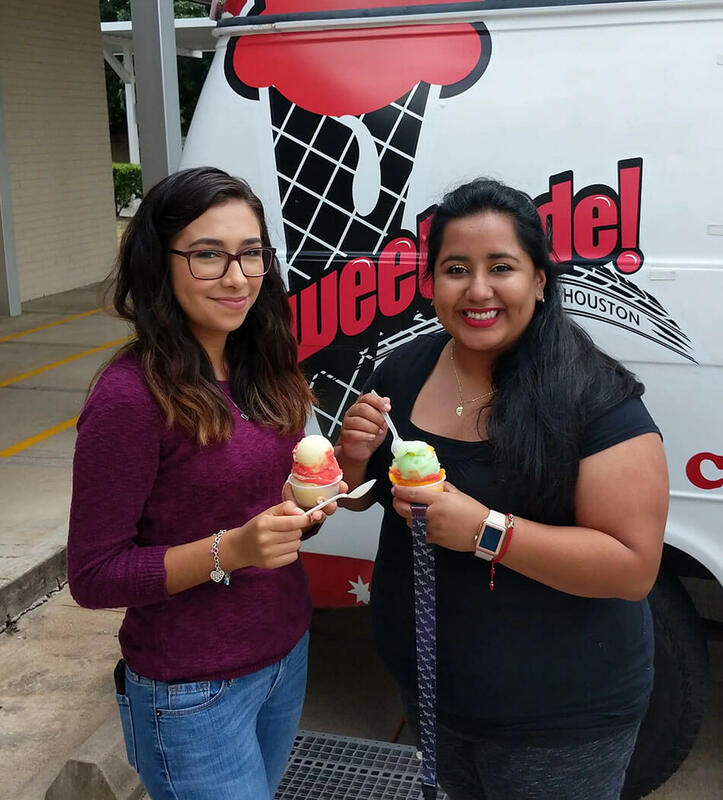 We teamed up withSweetRide to deliver an awesome back to school ice cream party for the teachers and staff. As a proud supporter of Spring Branch ISD in Houston, Cinco gave the school staff a truly ‘sweet’ start to the school year. Cinco believes that teachers have one of the most important jobs in the world, and we are grateful for everything that they provide to our local community. @Bear Blvd we think you are amazing and wish you a terrific school year! Landman Spring Break kicked off with PBLA’s Annual Executive Night on Tuesday, April 17th, held at the Petroleum Club in Midland. Alan Gilmer, CEO of Drillinginfo.com https://info.drillinginfo.com/speaker_post/allen-gilmer/ presented on massive US oil reserves in West Texas and how Drillinginfo serves as an invaluable resource for all landmen. The 2018 PBLA Education Seminar followed on April 18th, a seminar that broke the record as the largest attended education event in the history of PBLA hosted events. The seminar provided 8 full hours of West Texas insight: http://www.pbla.org/wp-content/uploads/2018/04/March_2018.pdf. My favorite presentation was George Snell and Greg Nibert on ‘Texas and New Mexico: Title War or Peace?” Both attorneys had extensive knowledge of different title laws pertaining to New Mexico and Texas. It was extremely helpful to see a side by side review of the way things are handled so differently in the two neighboring states. Following the Education Seminar, everyone walked over to The Bar for PBLA’s Annual Shrimp Boil. Attendees were lucky to have gorgeous Texas weather day, and it showed with over 800 attendees. As I squeezed through the crowd at this event, I ran into industry colleagues that I haven’t seen in over 10 years, proving that once again, West Texas is the place to be right now. You could feel the energy and excitement in the air as you had a beer and talked to those around you. The PBLA did such a fantastic job putting this event together. The final event of ‘Landman Spring Break” was the PBLA Golf Tournament held at Hogan Park Golf Course. This year it was a full day event with three courses and two rounds. Another beautiful Texas day where I was lucky to assist with registration and door prizes. Everyone that attended was a winner, for this event ran smoothly and it was a great day to be outside! All in all, Spring Break in Midland was incredible. The amount of time that went in to planning these events should be noted as wildly successful. A huge thank you Molly McAuliffe @P_B_L_A for hosting a week of smiling faces in Midland. That’s what it’s all about, making memories and new (and old) business contacts in the most active oil and gas play in the world! A Merry Bear Hug and Thank you! 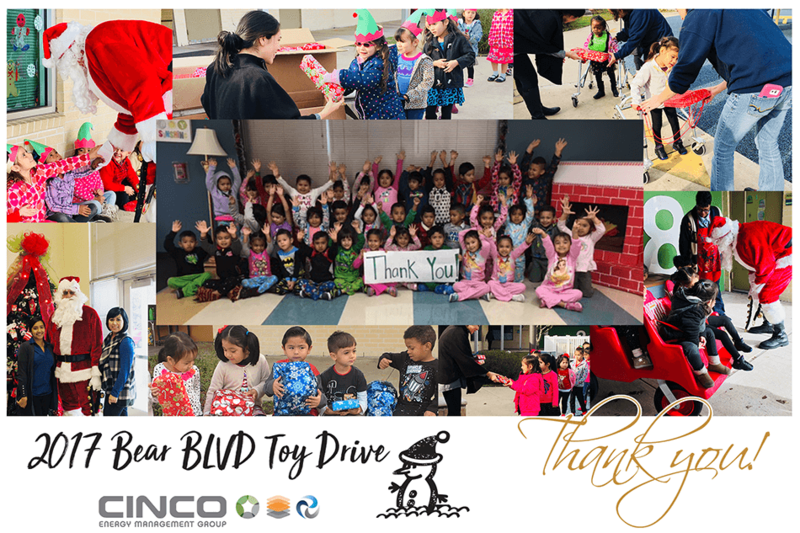 We would like to extend a sincere thank you to everyone who contributed to this year’s Bear Boulevard Toy Drive. Thanks to you, Cinco Energy was able to give 362 very deserving boys and girls special presents from Santa Claus this year. Santa’s sleigh was filled to the brim as he flew in for the day to deliver presents, take pictures and sing Christmas carols on Wednesday, December 13, 2017. Each Bear Boulevard child took a turn with Santa and gently whispered in his ear what they wished for this Christmas. Seeing the pure delight on each child’s face as they sat on Santa’s lap one by one, could turn any Grinch’s heart into pure gold! To each of you who helped us share the magic of Christmas with these children, we couldn’t have done it without you and we sincerely thank you for all your generosity. Please join us in spreading the holiday spirit! Cinco Energy is collecting toys for a Santa visit at one of our local Houston schools. 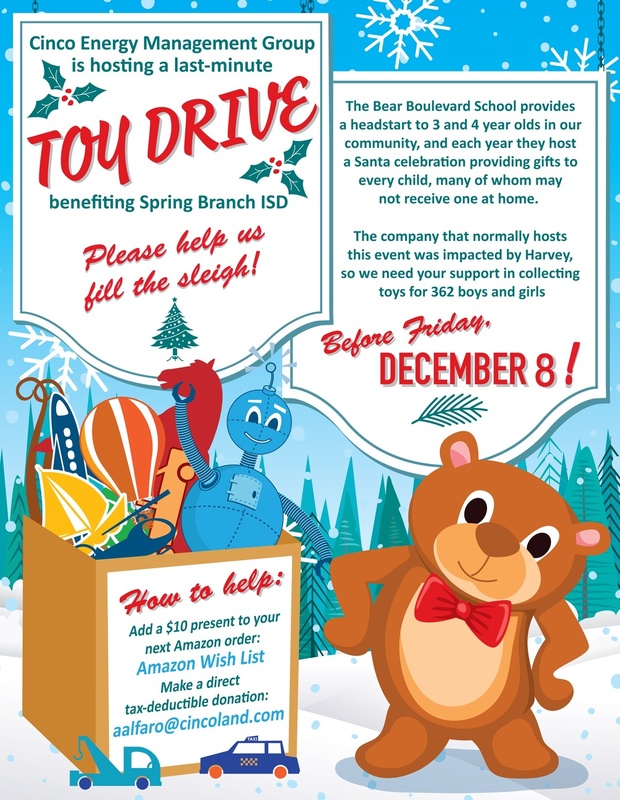 We are trying to help with an urgent toy drive as the school’s normal sponsor was greatly affected by Hurricane Harvey and is unable to fill Santa’s sleigh. 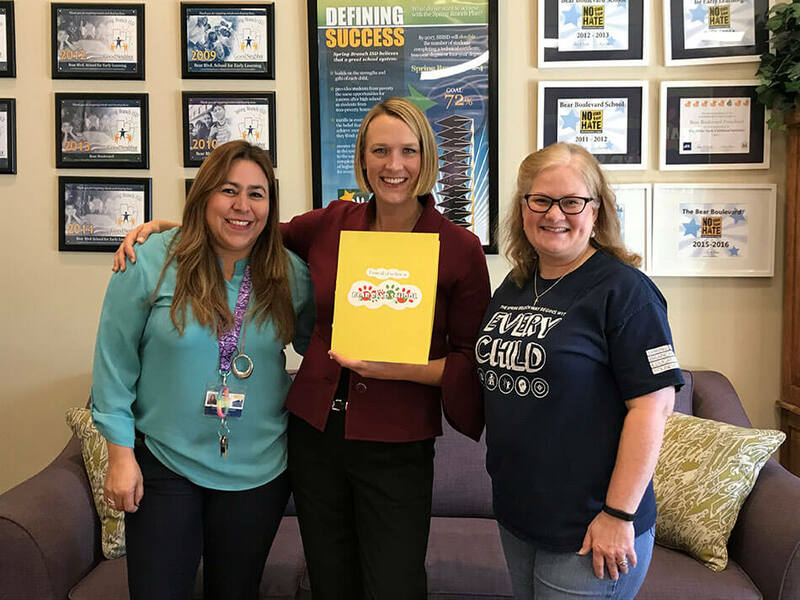 The Bear Boulevard School is a local Houston school providing early childhood intervention education to 3 and 4-year olds. Santa is scheduled to visit their school on Dec. 13th so we have one week to purchase and wrap 362 toys for these special children. Please consider adding a $10 toy from our Amazon Wish List before Friday December 8th or a tax-deductible donation is greatly appreciated! Your contribution will definitely put a Christmas smile on a deserving child's face. 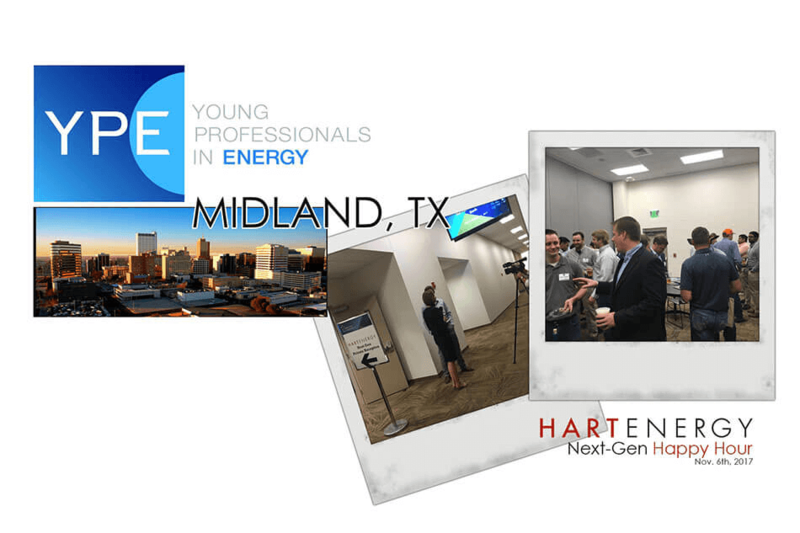 Sara Worsham represented Cinco Energy at a Young Professionals in Energy (YPE) event this month. YPE is a forum for networking and career development through social, educational, and civic service opportunities. The event offered a great opportunity to network with other young professionals and give insight into Cinco Energy. What's more, Sara looks forward to representing Cinco again at the next event. 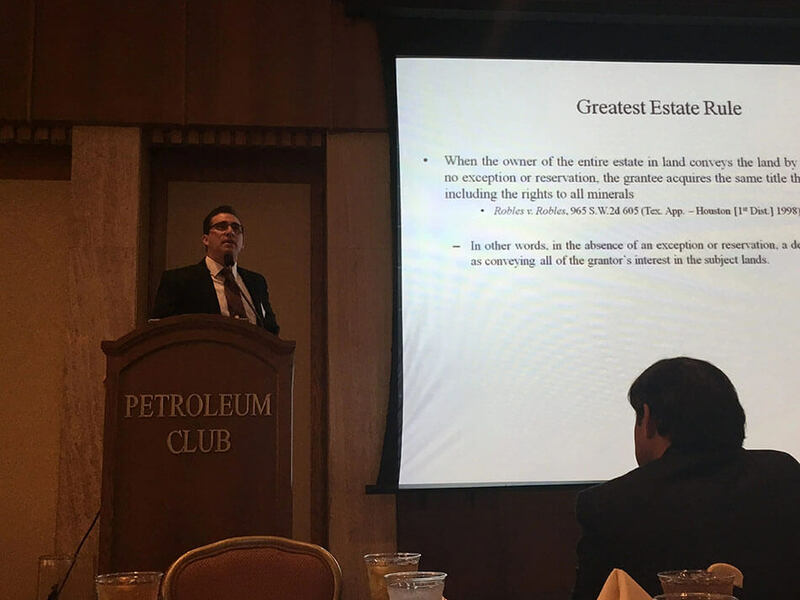 One of Cinco’s West Texas leaders, Sara Worsham, attended last week’s @PermianBasinPetroleumAssociation (“PBLA”) Luncheon at the Petroleum Club of Midland. Zackary D. Callarman discussed the “Pich Exception” and detailed the difference between certain reservation and exception provisions in the chain of title. Great presentation Zack! Cinco extended a huge ‘bear hug’ to the local Houston community post Hurricane Harvey. As a proud supporter of Spring Branch ISD, we were honored to send the staff at Bear Blvd. School a catered lunch the week Houston schools were back in-session. Our goal was to provide a very warm welcome back, along with one less thing to worry about for those dealing with personal loss at home. 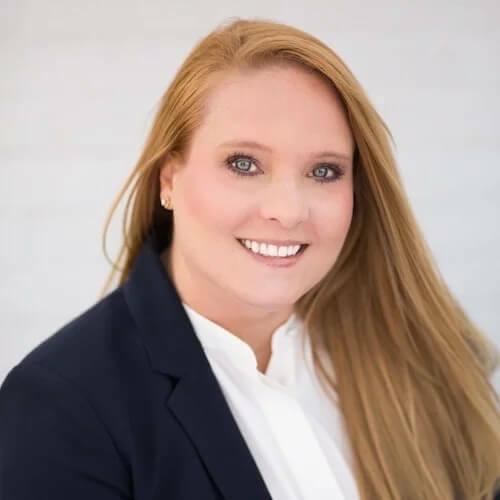 Cinco Energy Management Group LLC is pleased to announce that Sara A. Worsham, CPL has joined the company as Project Manager in our Houston office. Sara is a Certified Professional Landman with over twenty years of experience in the energy industry, most recently in large acquisition and title examination projects, with a specialization in title curative and seismic permitting. At Cinco, she will manage Leasing, Title and Mineral Acquisition projects and will focus on expanding our company’s footprint in the Permian Basin. Prior to joining Cinco, Sara worked as a Professional Landman in Texas and Appalachia, and has held similar positions with lawfirms and other consulting firms. 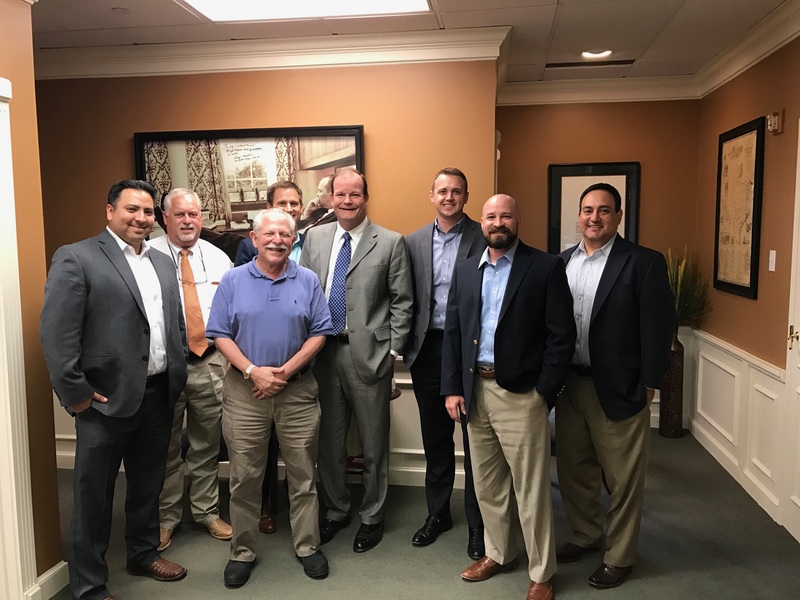 On Thursday March 23, Cinco Energy’s Mike Gibson, past President of Houston Association of Professional Landmen (HAPL), joined representatives of other regional Landman Associations in Austin, Texas for a TxALA meeting. to discuss news and issues effecting local landmen and regional associations. This meeting coincided with Texas Energy Day as lawmakers were in session at the Capitol. Those that attended included representatives from local AAPL chapters in Houston, Dallas, San Antonio and Permian. Issues discussed included how to include greater regional outreach for charitable events and how to better represent and grow regional membership. We support Mike and the other members of TxALA as they strive to unite local associations in Texas and the future generations of Texas Landmen. We will send you an email whenever a new blog posting has been published.